December 20, 2015 by Dreamz Unlimited! Thank you everybody who voted. May the most deserving nominee win in every category. December 1, 2014 by Dreamz Unlimited! This is the first music review of a Tamil film album as Musical Sameekshaa has extended its boundaries to Tamil, Telugu and Bengali film music. In the very first review, I find a very strange thing that this film “I” which is going to release on 9th January 2015, its music already got released 4 months back i.e on 15th September 2014. The film has been directed by a renowned Tamil director Shankar who has already worked with AR Rahman and given multiple hit albums. CLICK HERE to buy Full Soundtrack of I from iTUNES!! Rahman begins the soundtrack with a catchy techno tuned song that pleasantly engages you but soon you come to know that it’s actually partially hollow from inside as he doesn’t seem to have worked much with the composition. Neeti has an amusing cameo though Anirudh unfortunately hardly leaves any impact with his singing, more because of the vocal processing. The Violin piece in the second interlude is worth appreciating and the arrangements have been taken care of charmingly by the composer. That techno tune is what makes you return again and again for this song. Sid Sriram has actually nailed this one. There’s not a single moment when you don’t praise his singing, except the ones where Sunitha has played her short but lovely role, balancing the soothe with her classically woven textural voice. Along with Sid, there’s Flute, Guitar and typical Rahman-ish vibrant Piano pieces that provide you the much needed comfort zone in this technically complex track but that comfort zone dies out when the perturbed sounding arrangements in the Electric Guitar piece take over, although thanks to Sid for presenting his knack for flexible singing. The same lines crooned by Chinmayi in the Reprise version, sounds even better and more profound as the sweetness of her vocals goes deep and gets intense. This version is less complex in arrangements and hence has the ability to get more listeners in comparison. Chinmayi in Reprise, Sid Sriram in original have spelled their magic beautifully! Ladio is all about playing with techno sounds and Rahman has quite creatively played with that resulting it in sounding catchy, attractive and most importantly international. At one point, you forget that you are actually listening to a Tamil song. Nobody seems to be aware about the word “Ladio” but sounds like a mixture of Lady and Radio. Nikita Gandhi is pretty good with her singing, promisingly justified the genre of the track which is highly enjoyable and has an awesome international feel. Inspite of Natalie having done complete justice to what she is provided with, the song lacks goodness in the tune. Rahman has tried making it a “different” kind of track which upto certain extent, has worked in the form of excellent arrangements and setting up of the chorus, but lets the listeners down when you look out for a tune to croon. Aditya sounds pretty decent and Natalie’s operatic singing adds to the uniqueness of the track. Though “different” in many aspects, still gets boring after a certain point. This soundtrack is all about showing Rahman’s quality of being a techno-savvy. Pookkale Satru Oyivedungal is a winner among all the tracks. October 21, 2014 by Dreamz Unlimited! Super Nani is based on a Gujarati play “Baa Ae Maari Boundary” and by watching its trailer, it doesn’t seem to be anything more than just a play. Rekha being the lead, can only attract the viewers. The great news is that Harshit Saxena is finally back after a long hibernation though delivering songs like Haal-e-Dil and Mahejaan, it’s tough to imagine how we would have handled this kind of genre which has typical Rajshri touch to it. Still he hasn’t got the full album as one song is by the duo Sanjeev-Darshan. CLICK HERE to buy Full Soundtrack of Super Nani from iTUNES!! This is a kind of a “Bhajan” and who better than Shreya Ghoshal can handle such a track. It’s a typical traditional family oriented song. The tune is quite catchy and simple as most of the Bhajans do have. The song has been mixed very well. It’s a four-antara long song with modern beats by Harshit laid on the traditional Guitar playing and supportive Flute. Sameer has also done a justifying performance on demand. The USP is anyway Shreya as she just nails whatever genre the song has. Applauding effort by Harshit Saxena! You have heard many songs on mother, father, brother, sister, teacher, this must be the first song on grandmother, to be specific, a song on Nani as there’s already a song on Dadi. For Harshit, Sonu Nigam must be the perfect choice yet somehow Sonu completely fails to impress (which is quite rare). It may be because the melody is not effective. It loosens up the interest of the listeners after some time. Harshit is known for good melody, well that’s not his genre but still a composer is expected to be good at every genre. Not at all effective! Emotionally fake! The only thing to hear in this track is honestly Shreya Ghoshal. Otherwise, it’s so nonviable in today’s times. The composer gets behind the mic though for a small portion and completely disappoints. The percussion has been used well though not with any creativity. The Radhe shyaam part has a really nice and effective tune, rest of the song is completely avoidable. It’s better not to talk about Sameer’s lyrics. In the Rock Version, Harshit takes the center position and only worsen the condition. It’s way behind the time! Starts with a Shankh, and dynamic Dhol and Nagada take over the stage. A very short duration song with just one line in it. Haathi ghoda paalki, jai kanhaiya laal ki. Nothing to review! Everybody would be glad to see Harshit Saxena back on musical world, but what you get in this album, is a bucket full of disappointment. August 24, 2014 by Dreamz Unlimited! 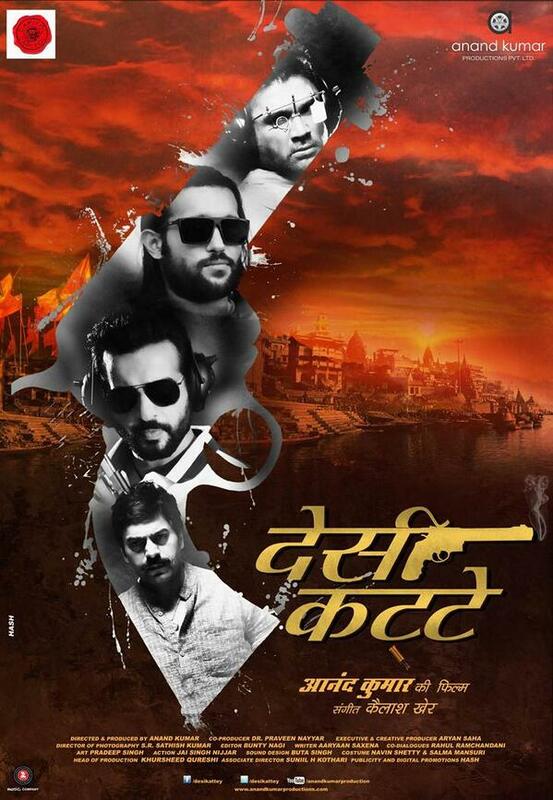 Desi Kattey is a movie about two friends, who’ve been making guns and accidentally learn shooting. The story is about their journey of how one of them represents India as a shooter in the Olympics and the other joins the under-world. It’s a story of good versus evil, how two pistol manufacturers choose diametrically different fields. So, the plot is quite good. Now everything is dependent on the director. Kailash Kher is the composer and that is the point which makes you a little attentive towards the soundtrack. CLICK HERE to buy Full Soundtrack of Desi Kattey from iTUNES!! Kailash Kher being proficient as a singer brings another professional Rahat Fateh Ali Khan. The song is on friendship and has very meaningful lyrics but the name “tak dhoom” deviates from the meaning of the song and has no meaning in itself. Rahat is superb in singing as it is only he who brings the song to a certain level. The arrangement has been done mainly on Harmonium and the percussion used is soothing. Pretty decent though provides nothing new. This song is unfortunately sounding aged. Although the melody is pretty good, the sound attached to it is very stale. Singers are the highlights actually. Akriti’s attenuated voice manages the first half well and the surprising factor of the song Sreekant does a superb job. His vocals specially in the higher notes are adorable. The sound of percussion makes the rhythm interesting enough to attempt the song. Insincere approach towards the song. Kailash Kher chose the correct song for himself. His vocals fit perfectly in these types of songs. Strangely he has used Ravanhatta which is very unlike of this genre. The tune is very average though we can’t accept much from these type of tracks but still Kailash Kher could have made it more interesting. The poor arrangement is one of the reasons for the song to sound very faded. The Violin part in the end is pretty good though. M.M. Manasi who has been credited hardly has any role. Staid and colorless. The two versions of the worst song of the album is a torturous effort from the makers. The film version has folksy elements, arrangements mainly being done on Harmonium and Dholak. Kailash Kher is superb with singing. In the other version Hard Kaur too is awesome with her English raps. Rekha Bharawdwaj’s voice though suits the song very well but the song sounds extremely cheap. The composition is itself cheap and Rekha’s vocals have made it cheaper. The line patnewaalu hoon is damn irritating. Do miss it! Desi Kattey – Kailash Kher was expected to deliver a good engaging soundtrack but he fails miserably, Albeliya rendered by Shreya Ghoshal being an exception. June 23, 2014 by Dreamz Unlimited! Vidya Balan, roaring the success, suddenly got blockage and two flops back to back came in her bucket. After being the housewife in both the flops, she has again now turned to a women-centric film in which she is playing the role of a detective. Shantanu Moitra has also been facing lots of flops for many years. And, I doubt this album would anyway help him. CLICK HERE to buy Full Soundtrack of Bobby Jasoos from iTUNES!! When a song with a good rhythm, nice instrumentation, pleasant tune, decent lyrics and the voice of Shreya Ghoshal doesn’t appeal you, it definitely means that there is something wrong with it. The wrongness is in the composition. This song is not made in a way which people today expect a song to be. It has an early 2000’s sound attached to it. Inspite of having everything good, it is not a kind of song which can attract people either in a massy way or in a classy way. Some hidden problem in the composition. Lack of appeal. It’s correct that you get very less space for a good composition to evolve in these type of tracks. Shantanu has well managed it though. With the help of Neeraj Shridhar, he has tried hard to make an interesting song but has failed. The rhythm is apt and so are the lyrics. Somehow, this track is not made for the appeal. Still, it is assumed that Shantanu could have done much better even with this genre. He has done a good use of Trumpets and the chorus. Much he could have done by reducing its duration. Unappealing. Uninteresting. It starts with a beautiful Banjo but as the song progresses, it gets worse. The hook line is intolerable and the worst part which is rare for songs. Monali Thakur has been wasted fully. The rhythm is again engaging but a good tune lacks here. This time, the lyrics also fail to help the song. The only good thing in the song is the instrumentation which is the speciality of Shantanu. Rest is a time waste. 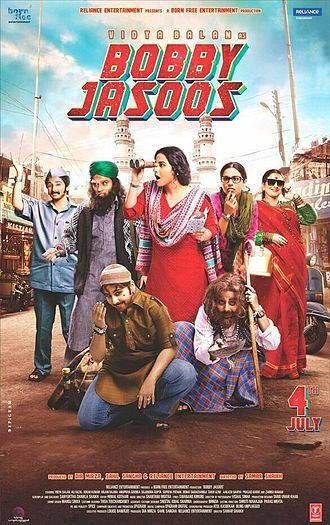 Bobby Jasoos: It’s a very small album with just four songs among which the only song that appeals, is Tu. The rest three are totally unappealing and waste of time. Although Shantanu seems to have given efforts in this album, things didn’t go right. The melodious semi-classical song Tu keeps Shantanu Moitra very much in the scene and saves this album to some extent. Papon sang that gazalish tune beautifully in Tu. The guy is one of the best singers of recent times but Shantanu did a mistake to add the fast mukhra in the song. It doesn’t suit with the beautiful ghazal part. Big big big big big thumbs down. I have always told about Shantanu that his songs are always undercooked. It’s very very incomplete. That’s why he is not still recognized well nor his songs played more than a week in anyone’s player or radio. Starting of Sweety is like Gunday Title track’s starting. But it doesn’t suit here, it suits well in Gunday song. April 15, 2014 by Dreamz Unlimited! Indians have the habit of blindly following their contemporaries. Mohit Suri, last year, gave a soundtrack which touched millions of hearts with Mithoon and Ankit Tiwari being the most popular in that multiple composer soundtrack. Now since their togetherness created a rage, other producers have started taking advantage of that. So, this Rajshri Productions’ Samrat & Co. have the same togetherness having one song by Mithoon, two by Ankit Tiwari and the remaining one by a trio Gopal, Anand and Pawan. This heard-before melody seem to belong to the previous decade. The tune is damn catchy and addictive but the overview of the song leaves a stale impression on the listener. Ankit has used Horns throughout the track and after a certain limit of time, it starts sounding boring as there’s no different interludes. In both the interludes, the same notes of Horn is played which soon vanishes all the excitement which you had after listening such an addictive tune. Shreya’s vocals contribute a lot in resisting the listeners’ excitement as her vocals have that glare which gives the glamorizing feeling to the ears. Ankit has just the hook line as a singer. Sanjay Masoom’s lyrics completely fail to impress. Tequila has no connection with the rest of the lyrics of the song. Just for the sake of a catchy name, he did that. And he did it quite badly. A one-time listen for the catchy tune and Shreya’s vocals. The rest attempts depend on a particular listener. The trio of Sun Raha Hai is back in this song. Sandeep Nath joins Ankit and Shreya with his writing. The song has been tried of creating a thrilling impact, a kind of suspense oriented atmosphere but the attempt seemed a failure as the track sounds more like a horror film song. Melody is undoubtedly beautiful. Shreya’s vocals sound enchanting and haunting. The whole haunt has been given by Piano with a flattering supportive rhythm. The antara is filled with variations making the song tough to sing. There’s not a single moment of plainness in the antara. Each note is entirely different from the other. As an overview, the song sounds simple but when you listen to it with care, it fascinates you for its variations. Lyrics by Sandeep Nath is not memorable as in Sun Raha Hai as this is of different genre, but very apt for the situation. It is thoughtful and metaphorical. One of the best haunting melodies. You wonder how and why in a melodious soundtrack, comes such a track. Although not intolerable, it’s a very staid composition which presents the irresponsible approach of composers towards the song. I wonder why the three guys hired Benny Dayal to sing such a lame track. They could have sung it together. The lyrics which are written by one of the composers Gopal, are just the boasting of how good Samrat and his company is. There are also some senseless boring dialogues in between which make it worse. Skip this one purposely. What Meri Aashiqui is for Tumhi Ho and Mujhe Ishq Se is for Baarish, O Humnavaa is for Shukr Tera. Gajendra Verma replaces Arijit in this but his part is absolutely different. The way Palak Muchhal starts Meri Aashiqui and it gets connected to Tumhi Ho, in the same way Gajendra Verma begins. The rhythm is completely different and not the typical Mithoon style. The line wo hai bhala depicts the Mithoon of pre-TumhiHo period. The so-called hook line O Humnavaa is beautifully composed with bi-directional notes. It has a single antara but sounds complete in itself. Considering Shukr Tera, this is equally worth the attempt. Since it’s a detective thriller, the theme track could have been pulsating and exciting. Sadly, the theme track completely fails to create any impact of thrilling experience. It rather contributes dullness towards the soundtrack. There’s no specific tune apart from the Violin which is continuously played throughout the track. A very ordinary theme track. 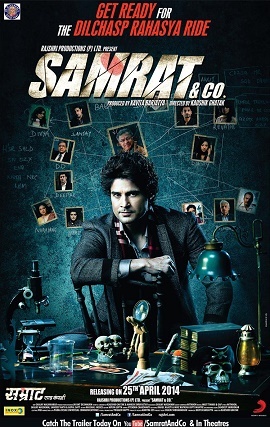 Samrat & Co. is saved by Mithoon and Ankit Tiwari. Tequila Vakila is an addictive heard-before composition, Sawaalon Mein has Ankit Tiwari trying something new and Shreya Ghoshal delivering a power packed performance. Mithoon’s Shukr Tera is as usual a strong melody rendered beautifully by Chinmayi, Arijit and Gajendra Verma in O Humnavaa. The title track by the trio and the theme track by Sandeep Shirodkar are leave without any impact. Samrat & Co. has Ankit Tiwari opening his genre driven boundaries and Mithoon coming up as a better lyricist than as a composer. Sony Music has finally tried the multi-composer formula which T-Series does in every other film. However,Sony Music has actually succeeded in getting the best from each of the composers. Ankit gives his best in his two songs, while Mithoon gives nice romantic tracks and GAP have given a great title track. Sony Music has succeeded where T-Series always goes wrong! Music-wise the album is great but not as good as the big hit albums of this year such as SKSE, Gunday, HTP or 2 States.But it will surely stay with you in the coming months. Shukr Tera- Chinmayi Sripada, Arijit Singh is highly recommended! Shukr Tera from Samrat & Co is worth hearing. Soothing and refreshing. Thank you Chinmayi, Arijit and Mithoon. March 23, 2014 by Dreamz Unlimited! AR Rahman has been doing a lot of experimentation in his albums since he has won the Oscars. Rockstar, Raanjhana and the latest Highway were full of experiments. Specially, Highway was an overdose of experiments. The composer made it so heavy that it became uneasy for an ordinary listener to carry the tunes with him. It is also rare for the composer to be seen with two albums back to back within a month gap. Kochadaiiyan, the movie which is in news for a while, has Rajnikanth in an animated role. It is India’s first of its kind. So, obviously Rahman was expected to experiment with its music, but surprisingly he has kept it sweet and simple. Yes, sweet and simple, a very rare combo for him. It’s two ARs singing the song together. No, not to be confused with that pop singer Rihanna. Raihanna is Rahman’s sister and mother of the music composer GV Prakash Kumar. Her vocals, particularly in this song, sounds stunning. She has not much role but whatever she got, sounded awesome in that. Often you have heard Rahman singing a soulful track. Here, he has attempted a different kind of track which is not niche` to his vocals. But what an incredible singing he has done! Marvelous! And what level of percussion has been used! It is vivacious. It will sound GRAND in theaters! Jonita’s vocal sounds too poor to give a good efficient start. As Arijit begins, everything comes into place. It stats with mild Rahman-ish Piano. The outstanding use of Tabla, Mrindangam and Matka create an old Rahman flavor. Mridangam actually resembles to that of Saawariya from Swades. Everybody was waiting for Arijit to sing for Rahman and when he actually did, the song witnessed an undying beauty. Interlude Violins and a systematic chorus increase its worth. It’s a soft romantic track with traditional Indian beauty and something which Rahman hasn’t composed for years. This song will make every Rahman fan proud. Again incredible percussion! I didn’t like the first line as it is too dramatic to be digested but since it’s for an animated film, apt! Now, the best line is the line crooned by splendid chorus Badlaav zindagi mein soch se hi aayega. What a beautiful catchy line which makes you feel that you are listening to something precious. After listening multiple times, you actually would start crooning it and I bet you would love to do that! Lyrically this song is a gem! It’s a king of inspirational tracks. Specially the lines said in the dialogue form are full of enthusiasm and practicality. I don’t know whether Irshad Kamil just translated the Tamil lyrics or he has added his creation. 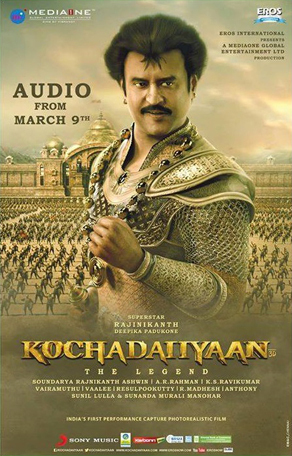 The orchestra that Rahman used in the dialogues in the heavy trenching voice of Rajnikanth, is phenomenal! In the end, we hear a classical rhythm section played with sincerity. One of the most melodious inspirational tracks! Something to proud of! Though it would have sounded superb in the voice of Shreya Ghoshal but Sashaa Tirupati who have sung in few film albums, have crooned it nicely. The first line struck me immediately being resembled with the line Gin paayega unke gun koi kya, itne shabd hi kahaan hain from the old Rahman song Pal Pal Hai Bhaari (Swades). Here, he has used Shehnaayi/Naadaswaram in the typical way along with Thavil in percussion. A mild Manjeera like sound is continuously played resulting it to be a masterpiece arrangement. While both the versions are exactly same, I personally prefer the female one as the melody is more suitable for the female voice. Swades, Lagaan, Taal wala Rahman is back! It is the most classically oriented composition of the album. Shreya’s part is more free from instrument and Javed’s part has plenty of percussion which give the song a multi directional approach. Shreya brings this near-to-perfect composition perfectionism and Javed aptly supports her vocals being soothing throughout the track. It starts and ends in a similar way with Shreya’s off-instrumental vocals. The end, in particular is very well given a base with Taanpura and finally ends with a bell. Ting! Height of impressiveness! Heavy use of percussion has been done, giving it an adorable rhythm. Rahman has always been excellent in managing his chorus, be it Ghanan Ghanan or Azeem-O-Shaan Shehenshah. It, I guess, must be an integral part of the background score and it deserves to get a place in the soundtrack as it’s a brilliant effort by the whole Rahman team. Will surely be a rich experience for the movie goer. It is again a part of the background score. It has been played by the London Sessions Orchestra. Flute with different brass instruments blended with the string section so well and they crossover each other beautifully as railway tracks do (a weird comparison though). You are gonna have a great time in theater. Finally the first single release originally named as Engae Pogudho Vaanam is again a wonderful example for the use of heavy percussion. It was released in October last year and received great response. I would recommend you to listen the Tamil version as the Hindi version sounds very odd and the lyrics seem to be not fitted perfectly. Also, the Tamil Version has SP Balasubrahmanyam which is itself a delight to listen and also makes a huge difference from any other singer’s voice. It sounds like a war song and AR has created it showing his immense understanding of every kind of situation. A not-so-good translation makes it ordinary in Hindi but incredible in Tamil. Kochadaiiyan is one of those few soundtracks which has the potential to live through generations. It’s a Tamil movie and therefore the songs originally are in Tamil but it’s good that they released the songs in Hindi and Telugu too to reach to wider listeners throughout India. Translating lyrics is one of the toughest job and lyricist always try to avoid this job due to the fear that they might go wrong. Swanand Kirkire made a huge regret for doing the translation of Robot songs. I don’t think Irshad Kamil would ever regret for this work because he has done a commendable job. Songs translated by him have words that beautifully blended with the tune and has not a single moment of oddness in them. AR Rahman, after a very long time, has composed songs like these which have traditional Indian melody and are far away from western music. Rahman kept his fusion mania far away from him, gave tunes which creates deja-vu experience and did things which he is known for.